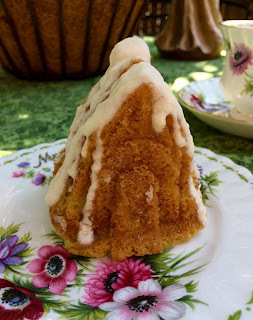 It's so pretty out today, and I've made us some mini cottage bundt cakes from my Cozy Village Nordic Ware pan. I wanted to use my Royal Albert March trio that my friend Colleen gave me last year. The pretty vintage hankie was included in the package from my teacup partner. I'll be sharing the teacup and the rest of my gifts soon, when Stephanie has her reveal party, sometime in April. The teacup has anemones on it, but I think it blends nicely with the pretty geranium basket that I put together. 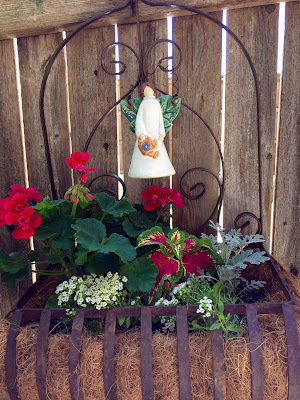 I love iron baskets, and this is another one that I fixed with some new coco fiber and pretty plants. My friend, Debbie, was kind enough to share her favorite birthday cake recipe that her mom used to make for her. Don't we all just love memories of our favorite foods and how they make us connected to those that we love? In a large bowl of electric mixer, combine the cake mix, pudding mixes, water, eggs, and oil; Beat on low speed for 30 seconds. Beat on medium speed for 2 minutes. Pour mixture into a grease and floured 10" bundt pan. I like to use a cooking spray, such as Baker's Joy, that has the flour and oil mixed because it gets into all the crevices. Bake at 350 degrees for 60-70 minutes, or until a toothpick inserted comes out clean. If using the mini bundt pans, check between 22-27 minutes. In a small bowl, combine the Glaze ingredients, adding enough milk to reach desired consistency. Drizzle over cake. Royal Albert has such pretty china. Love your teacup. That bundt cake looks so good. Thanks for sharing the recipe, Kitty. What a beautiful tea cup Kitty, a perfect pairing for your delicious pistachio cake from Debbie! I do remember years ago when this type cake was all the rage! Have a delightful week! I'd love to share a cup of tea and cake in your yard with you. I like iron planters, too. A stark comtrast between your corner and mine. 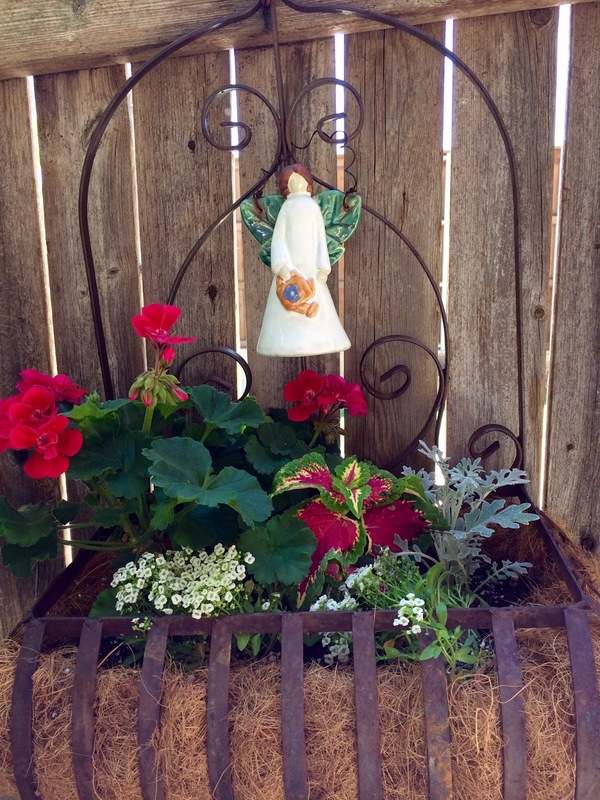 My iron planter still holds the Christmas arrangement. That is the sweetest little individual Bundt cake. I always enjoy your tea time in the garden. Your pretty outdoor tea is the perfect way to say good-bye to March. I love pistachios and need to enjoy it more in my desserts. I'm looking forward to the big teacup reveal. My package came from a non-blogger in Texas. Everything arrived intact...except for the poor chocolate rabbit that couldn't stand the Texas heat! That's a beautiful teacup and saucer and such pretty colors. The bundt cake sounds really good. I have a recipe like that, but you add vanilla pudding and it is the moistest cake ever. 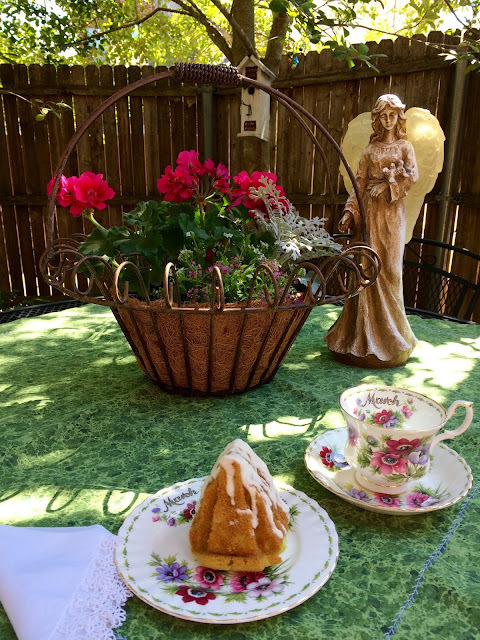 Beautiful day to have cake and tea outside. Your geraniums are lovely and accents your lovely teacup. My goodness, you've received your exchange parcel already? The hanky is delicate and feminine, can't wait to see your teacup. I just had an email from Nordic Ware advertising their little bunnies cake pan for Easter which I just love. Do the cakes come out of the molds easily Kitty? Enjoy your gorgeous weather and send some our way please? Oh what a beautiful springtime post! I cannot wait to be able to get my hands dirty and get busy planting...maybe even this weekend! 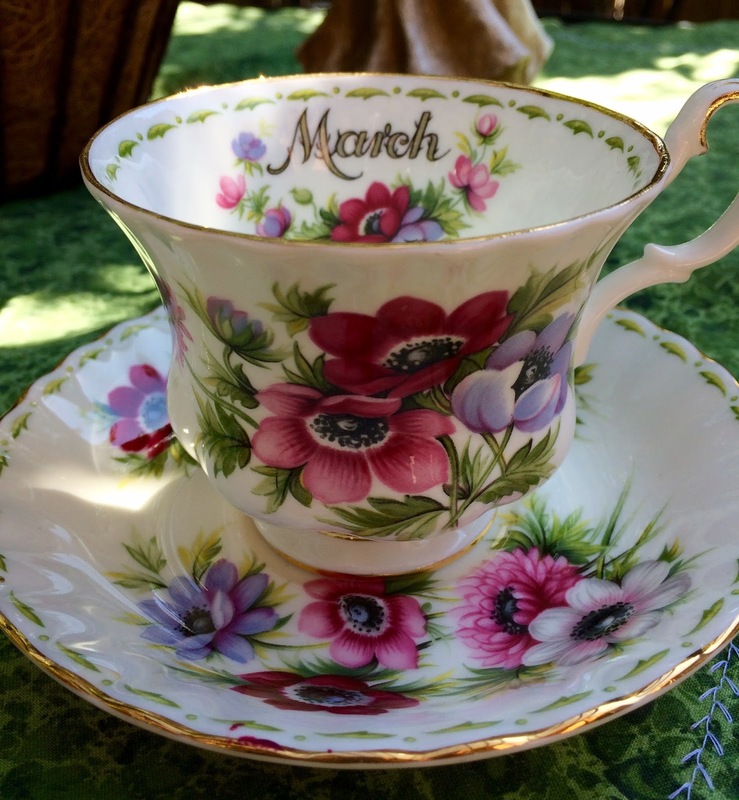 Your March teacup is absolutely stunning as well as that hanky. And did you mention pistachio? Oh my...one of my favorite flavors but I have to say I've never had it in a cake...that has got to be delicious! May your week be blessed, my friend! Perfectly beautiful! I love iron baskets as well. I just may have to give this a try as my sweet Dad loves anything pistachio. Happy week! Kitty, iron baskets are so nice. It's garden time for sure. So nice to see you sitting outdoor again. The cake sounds wonderful. I just bought some pistachio pudding I want to make. The teacup is beautiful. Everything is so lovely. The cake and your teacup and tablescape looks and feels like spring. Love this cake. Your molds are adorable. Oh you know how to put on a lovely spread! Your Royal Albert China is gorgeous, I love your pretty March trio! And the geraniums match perfectly, I think with the fun spring cake, pistachio.. yum! How fun to use your little Nordic baking ware pans to make mini cakes, that is a treat in itself :) Your spruced up ironware is lovely too... how wonderful to know that spring is in the air! Sounds like Spring for sure! Your teacup is just beautiful! Have a happy week! Thanks for sharing the pistachio bundt cake. I love those nuts. Mine won't look as good as yours does though. Beautiful teacup! Your cake sounds delicious, Kitty. What a beautiful sight your leafy green trees must be! We are having another snow storm move in overnight. I am so tired of the cold and snow! It feels like this winter is just dragging on. That is a pretty teacup and the lovely hankie as well. Enjoy the rest of your week, my dear friend. I love pistachio pudding and am amazed at how many people haven't tried it. I have never tried it in a cake though. Very yummy. Such a cute little house cake....and what a GORGEOUS teacup & saucer!! Totally in love with that one! Thanks for the recipe. I don't think I've ever tasted pistachio cake. I look forward to doing so very soon. What a pretty setting for a pretty teacup. My husband loves pistachio so I am happy to have this recipe. Thank you! Hi Kitty, Oh I just love your March tea cup and it does look beautiful with your pretty geranium basket. What a nice way to say goodbye to March too. The cake recipe sounds so good. Thank you for sharing it. I will try this for sure. We love pistachio too. Enjoy the pretty weather. I will be back soon. Kitty, I love that trio! And it's perfect with your geranium basket. What a lovely setting for a nice cup of tea and a bit of cake. Yum! Gosh I'd like to hop on a plane and meet you there for tea RIGHT NOW! And some of that yummy cake. I LOVE pistachio -- I think I shall have to make this this weekend!! Hi Kitty...a bit late as my honey is having some med issues. Love your March teacup! The set is a great set of designs! And the cake looks wonderful How nice you could have tea outside...still cool and rainy here. Thanks so ,uch for linking to Tuesday Cuppa Tea! What a beautiful tea cup Kitty, and a delicious Pistachio Bundt Cake to go with it. I would so enjoy a cup of tea and a slice of your cake! The weather is so beautiful I am sitting on my new screen porch and enjoy the day while I talk to all our friends. Hope you are enjoying this awesome day before our next wave of storms. Hope you are having a great weekend and thanks so much for sharing with us at Full Plate Thursday! Hi Kitty, I love your pretty teacup with the anemones! I have the July one, which is my birth month. That Bundt cake sounds delicious! I bet it is so moist. Thanks for sharing with SYC. Your March cup is a treasure. Happy April! Kitty, you know how much I love your pretty teacups, baking and lovely yard. Thanks for sharing at DI&DI. Pinning so I can try this, it sounds wonderful!